Bricks are laid on the outside of a new building Thursday, July 27, 2017 at Mission High School. 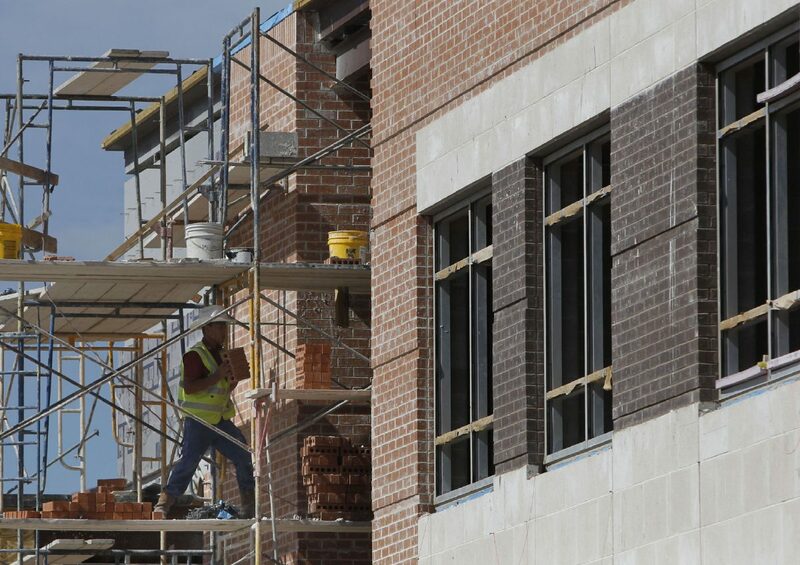 MISSION — A massive construction project is still taking over Mission High School, where construction crews are doing everything from building a new grand entrance, to new classrooms and expansions all over the campus. The project is part of the Mission school district 2008 bond program and is being budgeted at about $33 million. The plan includes building 38 new classrooms, a new cafeteria with capacity for 1,000 students, a new agricultural sciences building, the expansion of the old band hall to incorporate all fine arts, and a new entrance with a more centrally located administrative office area. The original campus was built in the early ‘60s, with additions throughout the years. But in order to accommodate the new construction, the original library building and a cafeteria space were demolished. Every other building that will not remain as classrooms will be reused and remodeled, such as the administrative area. Salvador Sanchez tapes a window for painting Thursday, July 27, 2017 at Mission High School. The school has several buildings under construction throughout the campus. Construction crews work on the exterior of a new building at Mission High School on Thursday July 27, 2017 in Mission. 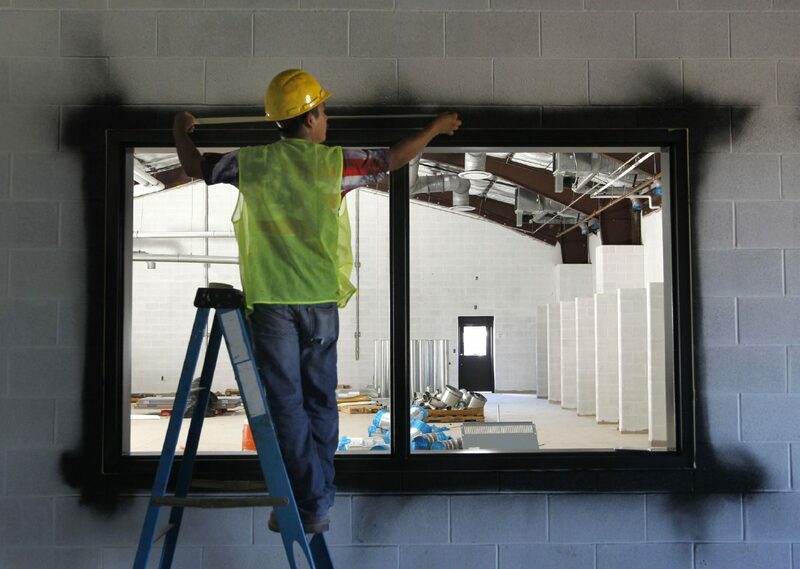 The main entrance to the school is now well defined with what seem to be giant windows that will soon lead to the main lobby space with the administrative offices to the left and entrance to the instructional buildings to the right. This includes a new two-story building that will accommodate the new 38 classrooms. 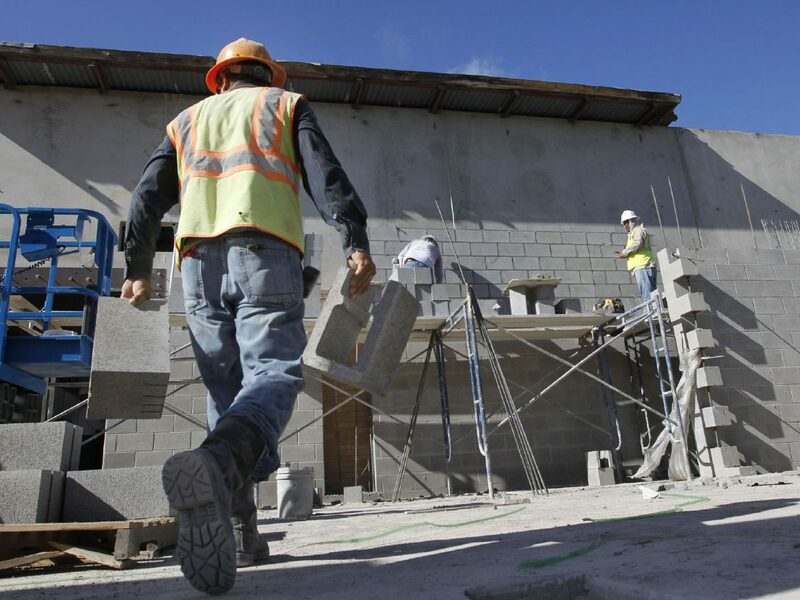 Construction officially kicked off in June 2016, when students were moved to portable buildings where they will also begin the 2017-18 school year as construction is expected to be completed until January 2018. The original completion date had been set for November 2017, he explained, but the builder was granted an extension due to several weather days and testing dates where construction had to stop. The kitchen is one of the biggest renovations considering it will be fully equipped for meal preparation on-site, unlike many other schools that only have equipment to reheat meals prepared in a central kitchen. Also seeing major transformation is the old band hall, which is going from one to two stories and expanding outward to now incorporate other fine arts programs such as mariachi, choir and dance. The board approved this part of the renovation and the new agricultural and welding shop in 2015 at an estimated cost of $4 million. The district refers to this project as Phase III, with the initial phases completed years ago to address smaller renovations such as replacing ceilings, lighting and handicap accessibility and retrofit for a lot of the old buildings. This part of the construction was the most impactful in terms of budget and overall scope.